Yeah, that's not black. It's white or green. Would be black if it pulled from the graveyard. Also seems fairly weak, compared to Savage Summoning. I guess it lets you put off-colour creatures into play, though, and if I'm reading it right you can use it to make a non-flier block a flier. So it's not useless. 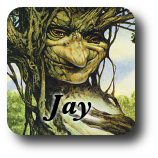 My leaning is toward green, as this is a sort of a way of giving a creature flash for an extra B. Neat though. I thought there more examples of this sort of effect being in black, but I guess all I was remembering was Cauldron Dance, which really just leverages the Red in its cost to perform a Sneak Attack. But jeez, Nemesis Trap is such a weird card. 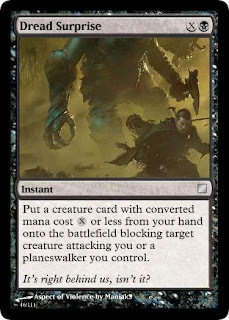 I'm fairly certain Nemesis Trap just got grandfathered in as a callback to Broken Visage (http://magiccards.info/5e/en/11.html). I think Sanctaphrax has got the right of it. Ah yes, the ever so valuable Homelands-reference slot, integral design-space for every Expert expansion. Don't diss Broken Visage. I drafted Homelands once (huge mistake btw, although someone pulled Baron Sengir) and Broken Visage totally won a game for me. But yeah, I don't really understand Nemesis Trap either. I think "put onto the battlefield blocking" is an interesting space. I think of it as white but there's not a lot of precedents. But maybe "put onto the battlefield and fights" does a similar job with less rules baggage? The risky thing about "put onto the battlefield blocking" is that most players will assume the block must be legal. I'm not as concerned about players playing suboptimally due to rules misunderstanding as breaking the rules. That argument doesn't quite work for me because we get into O-Ring stacking territory where a player who does understand the rules makes the optimal play and their opponent feels like they're cheating. 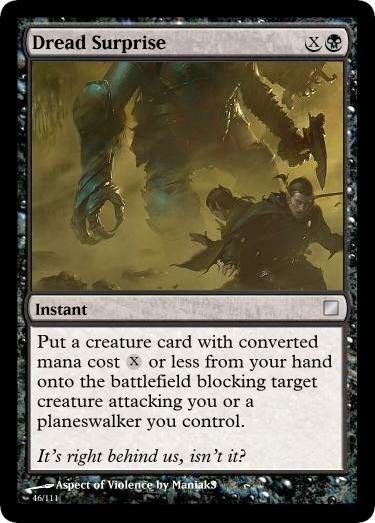 Return target creature card from your graveyard to the battlefield blocking target creature attacking you or a planeswalker you control. Exile it at the end of combat. Let it live (if it survives) and this is awesome, and plenty black. Costs more, obv. Scout's Warning! That's the card I was sure existed but could not find on Gatherer. Scout's Warning.